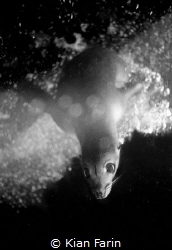 The Curious Sea Lion / Shot on film on my Nikonos V, this is the first analog image I've taken that I am truly in love with. No strobes or external light, just the sun. Shot in about 20ft of water under the oil rigs off San Pedro.